Do you feel sad or hopeless? You don't have to feel that way! We want you to know that there is a God out there that loves you and wants to know you. 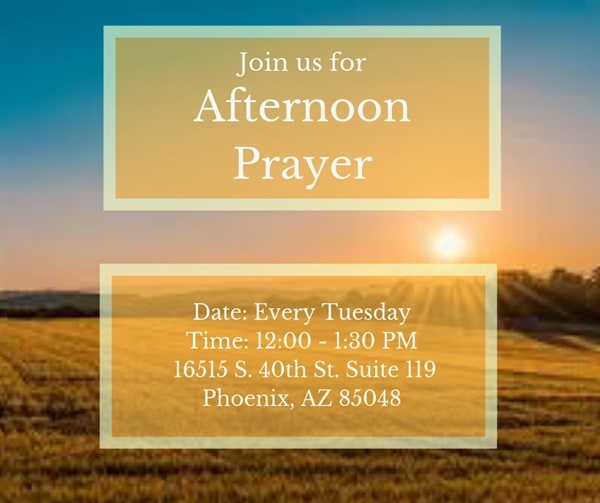 Please join us for Afternoon Prayer! At Afternoon Prayer, anybody is allowed to come and be prayed for, whatever is on your mind, whatever is on your heart is welcome to be dropped at Afternoon Prayer and prayed for by people, who truly care about you. It is a free event and you do not have to be a patient of Ahwatukee Health and Recovery to join. We just want everyone to know that they are loved and cared about regardless of what they have done or what they have experienced. PLEASE NOTE THAT PRAYER NIGHT WILL NOT BE SCHEDULED ON THURSDAY NIGHTS STARTING 11/15/2018.